sri-caitanya-of Lord Caitanya; manah- mind; abhistam-what is desired; sthapitam-established; yena-by whom; bhu-tale-on the surface of the globe; svayam-himself; rupah-Srila Rupa Gosvami; kada-when; mahyam-unto me; dadati-will give; sva-his own; pada-lotus feet; antikam-proximity to. When will Srila Rupa Gosvami Prabhupada, who has established within this material world the mission to fulfill the desire of Lord Caitanya, give me shelter under his lotus feet? vande–offer my respectful obeisances; aham–I; sri-guroh–of my spiritual master; sri-yuta-pada-kamalam–unto the lotus feet; sri-gurun–unto the spiritual masters; vaisnavan–unto all the Vaisnavas; ca–and; sri-rupam–unto Srila Rupa Gosvami; sa-agra-jatam–with his elder brothers Sri Sanatana Gosvami; saha-gana-raghunatha-anvitam–with Raghunatha Dasa Gosvami and his associates; tam–unto him; sajivam–with Jiva Gosvami; sa- advaitam–with Advaita Acarya; sa-avadhutam–with Nityananda Prabhu; parijana-sahitam–and with Srivasa Thakura and all the other devotees; krsna-caitanya-devam–unto Lord Sri Caitanya Mahaprabhu; sri-radha-krsna-padan–unto the lotus feet of Radha and Krsna, saha-gana–with associates; lalita-sri-visakha-anvitan–accompanied by Lalita and Sri Visakha; ca–also. namah–obeisances; om-address; visnu-padaya–unto him who is at the feet of Lord Visu; krsna-presthaya–who is very dear to Lord Krsna; bhu-tale–on the earth; srimate–all-beautiful; bhakti-vedanta-svamin–A. C. Bhaktivedanta Swami; iti–thus; namine– who is named. I offer my respectful obeisances unto His Divine Grace A.C. Bhaktivedanta Swami Prabhupalda, who is very dear to Lord Krsna, having taken shelter at His lotus feet. namah–obeisances; to–unto you, sarasvate deve–servant of Bhaktisiddhanta Sarasvati Gosvami; gaura-vani–the message of Lord Caitanya; pracarine–who are preaching; nirvisa–impersonalism; sunya-vadi–(from) voidism; pascatya–Western; deska-countries; tarine–who are delivering. Our respectful obeisances are unto you, O spiritual master, servant of Sarasvati Gosvami. You are kindly preaching the message of Lord Caitanyadeva and delivering the Western countries, which are filled with impersonalism and voidism. I offer my respectful obeisances unto His Divine Grace Bhaktisiddhanta Sarasvati, who is very dear to Lord Krnsa, having taken shelter at His lotus feet. sri-varsabhanavi-devi-dayitaya–unto Sri Varsabhanavi-devi-dayita Dasa, the servant of the lover of Srimati Radharani; krpa-abdhaye–who is an ocean of mercy; krsna-sambandha–(of) the relationship with Krsna; vijnana–(of) the science; dayine–who is the deliverer; prabhave–unto the master; namah–obeisances. I offer my respectful obeisances to Sri Varsabhanavi-devi-dayita Dasa [another name of Srila Bhaktisiddhanta Sarasvati, who is favored by Srimati Radharani and who is the ocean of transcendental mercy and the deliverer of the science of Krsna. madhurya–conjugal; ujjvala–brilliant; prema–love; adhya– enriched with; sri-rupa-anuga–following Srila Rupa Gosvami; bhakti-da–delivering devotional service; sri-gaura–(of) Lord Caitanya Mahaprabhu; karuna–(of) the mercy, sakti–energy; vigrahaya–unto the personified; namah–obeisances; astu–let there be; to–unto you. namah–obeisances; to–unto you; gaura-vani–teachings of Lord Caitanya; sri-murtaye–unto the personified; dina–(of) the fallen; tarine–unto the deliverer; rupa-anuga–the philosophy which follows the teachings of Srila Rupa Gosvami; viruddha–against; apasiddhanta–(of) unauthorized statements; dhvanta–the darkness; harine–unto you who are removing. I offer my respectful obeisances unto you, who are the personified teachings of Lord Caitanya. You are the deliverer of the fallen souls. You do not tolerate any statement which is against the teachings of devotional service enunciated by Srila Rupa Gosvami. namah–obeisances; gaura-kisoraya–unto Gaurakisora Dasa Babaji; saksat–directly; vairagya–renunciation; murtaye–unto the personified; vipralambha–(of) separation (from Krsna) rasa–(of) the mellow; ambhodhe–O ocean; pada-ambujaya–unto the lotus feet; te–your; namah–obeisances. I offer my respectful obeisances unto Gaurakisora Dasa Babaji Maharaja [the spiritual master of Bhaktisiddhanta Sarasvati], who is renunciation personified. He is always merged in a feeling of separation and intense love of Krsna. namah–obeisances; bhaktivinodaya–unto Srila Bhaktivinoda Thakura; sat-cit-ananda-namine–known as Saccidananda; gaura–(of) Lord Caitanya; sakti–energy; svarupaya–unto the personified; rupa-anuga-varaya–who is a revered follower of Srila Rupa Gosvami; te–unto you. 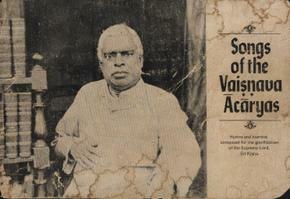 I offer my respectful obeisances unto Saccidananda Bhaktivinoda, who is transcendental energy of Caitanya Mahaprabhu. He is a strict follower of the Gosvamis, headed by Srila Rupa. gaura–(of) Lord Caitanya; avirbhava–(of) the appearance; bhumeh–of the place; tvam–you; nirdesta–the indicator; sat-jana– (to) all saintly persons; priyah–dear; vaisnava–(of) the Vaisnavas; sarvabhaumah–chief; sri jagannathaya–unto Jagannatha dasa Babaji; te–unto you; namah–obeisances. I offer my respectful obeisances to Jagannatha Dasa Babaji, who is respectful to the entire Vaisnava community and who discovered the place where Lord Caitanya appeared. vancha-kalpa-tarubhyah–who are desire trees; ca–and; Krpa– (of) mercy: (of) mercy; sindhubhyah–who are oceans; eva–certainly; ca–and; patitanam–of the fallen souls; pavanebhyah–who are the purifiers, vaisnavehhyah–unto the Vaisnavas; namah namah–repeated obeisances. 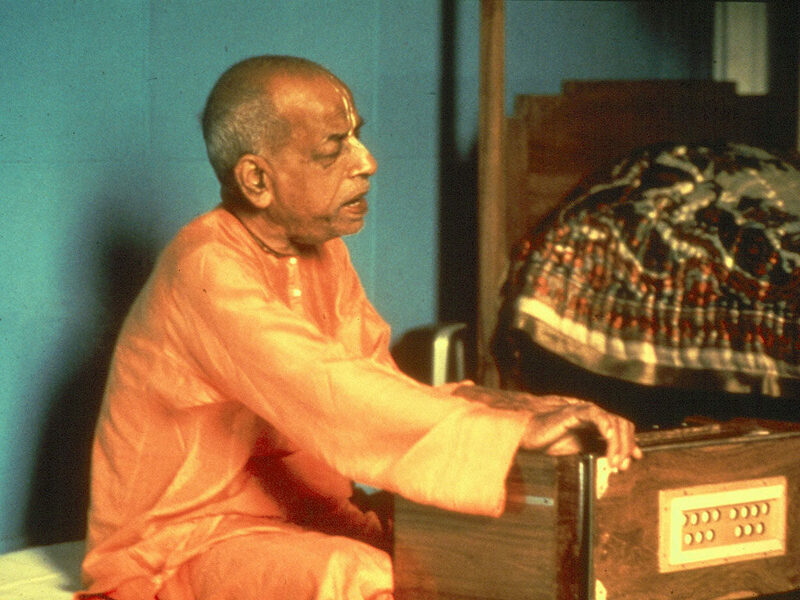 I offer my respectful obeisances unto all the Vaisnava devotees of the Lord. They are just like desire trees who can fulfill the desires of everyone, and they are full of compassion for the fallen conditioned souls. namah–obeisances; maha-vadanyaya–who is most magnanimous; krsna-prema–love of Krsna; pradaya– who can give; te–unto You; krsnaya–the original Personality of Godhead; krsna-caitanya-namne–under the name Krsna Caitanya; gaura-tvise– whose complexion is the golden complexion of Srimati Radharani; namah–obeisances. panca-tattva-five features; atmakam– consisting of; krsnam–unto Lord Krsna; bhakta-rupa– form of a devotee; sva-rupakam–personal form; bhakta-avataram–in the form of incarnation; bhakta-akhyam–celebrated as a devotee, namami–I offer my obeisances; bhakta-saktikam–the giver of the energy of a devotee. he–O; krsna–Krsna; karuna-sindho–O ocean of mercy; dina– (of) the distressed; bandho–O friend; jagat–(of) the universe; pate–O Lord; gopa-isa–O master of the cowherdmen; gopika-kanta–O lover of the gopis; radha-kanta–O lover of Radharani; namah–obeisances; astu–let there be; to–unto You. O my dear Krsna, You are the friend of the distressed and the source of creation. You are the master of the cowherdsmen and the lover of the gopis, especially Radharani. I offer my respectful obeisances unto You”. jayatam–all glories; suratau–who are engaged in amorous pastimes; pangoh–who am lame; mama–of myself; manda-mateh–having depraved intelliegence; gati–the shelter; mat–my; sarva-sva–be all and end all; pada-ambhojau–whose lotus feet; radha-madana-mohanau– to Sri Radha and Madana-mohana. divyat–shining; vrndaaranya–in Vrndavana; kalpa-druma–the desire tree; adhah–under; srimat–opulent; ratna–bedecked with gems; agara –in a mansion; simha-asana–on a throne; sthau–who are seated; sri-sri-radha–Sri Radha; srila-govinda-devau–and Sri Govinda; prestha-alibhih–by female attendants; sevyamanau–being served; smarami–I meditate upon. sriman–worshipable Lord; rasa-rasa–of the rasa-lila; arambhi–the inaugurator; vamsi-vata–of the Vamsivata tree; tata–at the base; sthitah–seated; Karsan–attracting; venu–of the flute; svanaih–with the sounds, gopih–the gopis; gopi-nathah–Master of the gopis; sriye-astu–may He be auspicious; nah–unto us. tapta–molten; kancana–like gold; gaura–fair complexion; angi– whose body; radhe–O Radharani, vrndavana-isvari– the Queen of Vrndavana; vrsabhanu-sute–the daughter of King Vrsabhanu; devi–O goddess; pranamami–I offer my respects; hari-priye– very dear to Lord Krsna. “I offer my respects unto Srimati Radharani, whose bodily complexion is like molten gold and who is the Queen of Vrndavana. You are the daughter of King Vrsabhanu, and You are very dear to Lord Krsna”. This entry was posted in Chanting Hare Krishna, Pranams (Prayers), Songs of the Vaisnava Acaryas and tagged Hare Krishna mantra, mangalacarana, om ajana, panca-tattva, Pranams, prayers, songs, Songs of the Vaisnava Acaryas, sri guru pranama, Srila Bhaktivinoda Thakur, Srila Prabhupada, vaisnava songbook. Bookmark the permalink.